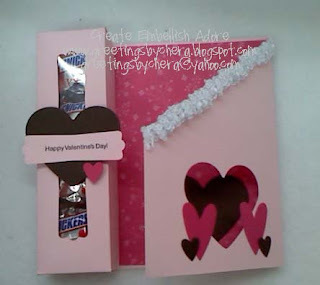 Create Embellish Adore: Day 9.... Chocolate Card ..
Day 9.... Chocolate Card ..
﻿ So I played around with the candies in the box... yes there are 4 Snickers (the one bite size- Valentine style)- each have messages written on the wrapper - like Crazy for you, XOXO ... I am sure there are more but I wasn't going thru the whole bag to find them all. I chose the silver wrappers and put them in the box... and walked away from the bag.. which later was being consumed by the Other half and teens. 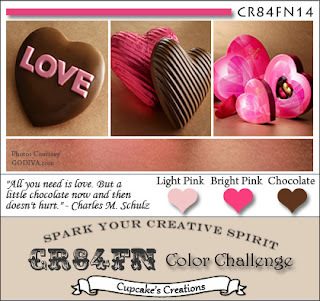 I will have the tutorials, instructions, etc for the CHOCOLATE COVERED FEBRUARY PROJECTS completed and ready for you on February 15, when I announce the winner of the BLOG CANDY!!!! Wow I love that project! What a great idea as a little gift for the kids at school. Thanks for sharing can't wait to see the instructions on the 15th. Chera Cupid! How adorable. Of course there's the chocolate which I think is a permanent attachment for me. I'm not sure that I could continue with this hobby if I no longer did chocolate. I give it to my coworkers for all the holidays in some cute little container. This is a cute one and can't wait to see your instructions! Have a great day! Great project Cupid Chera!!! I could use some of those snickers now...been one of those mornings LOL! 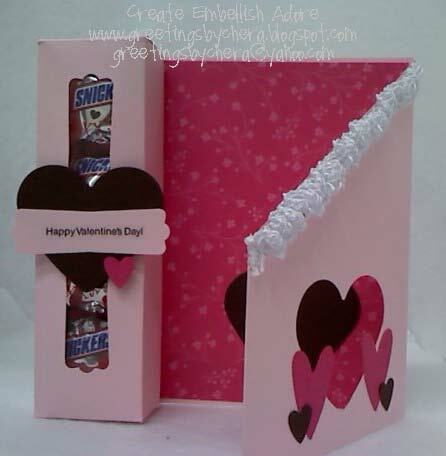 Chera - YES I will be your Valentine with this CUTE treat filled with Snickers! My FAV! How FUN is this???!!! THX for playing with us at Cr84FN! Another STUNNING project!! Keep up the GREAT job!! This is a very neat card! I just love it and can't wait for the tutorial. Thanks for sharing. Great card! I just love it. Thanks for sharing. I can't wait for the tutorials for all of your great projects. Chera Cupid you seriously rock! You are so creative!! Love all the ideas....as do my teen girls who are "mom can we make that too"....so you are loved by three in this house! Thanks for the inspiration! Chera you are my cupid! I just LOVE Snickers and this treat/card is gorgeous. Thanks so much for playing along at CR84FN this week! I really like your card and the box keep up the good work. Chera Cupid you are truly amazing!! Seriously, I don't know how much more chocolate temptations I can stand. Your projects just get better each day. Off, to search the house for chocolate! Thanks for sharing. Such a lovely project and really, truly scrummy!!! Thanks so much for playing along with CR84FN this week! Altho I enjoy looking at various blogs, I seldom leave a comment, but this little box is just too cute. Have printed out your recipes the last couple of days and look forward to the tutorial on this box! Love is in the air! This box is so cute and the insides so tasty ! Yum Yum! Oh, "Chera Cupid," I am having a ball going through these posts. I love all your treat ideas and yes Rose Red and all pinks are my favorite colors!! And of course I love chocolate -- especially Snicker Bars (the only candy bar I buy). This is so much fun. YUM! For the card and the delicious treats inside!!! Thanks so much for playing along with CR84FN! Such a beautiful take on the challenge colors! How cute! I love this idea, what a fun gift! Thank you so much for playing with CR84FN! Love your card / treat holder! Just lovely! Thanks for joining us at CR84FN! This has to be my favorite!! !